Our generation is experiencing an epidemic of crappy jobs. Jobs that a monkey, who’s not one of those smart elite monkey’s, could handle. Employment opportunities that smirk in the face of that bright-white college education — our expensive liberal studies degrees not exactly equating to our lucrative dream come true. I’ve had a slew of crappy jobs in my 20’s. But now at 29, I am thankful for all the jobs I once lamented. It’s because of them, not in spite of, that I’ve begun to enter into that sweet spot of my passion aligning with how I make some moola. Yes, I know. I’ve so been there. It’s not easy. It’s not pretty. 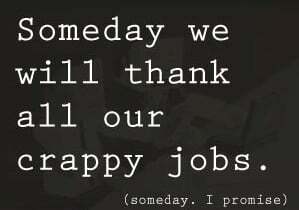 But here’s 3 and 1/2 reasons you can be thankful for all your crappy jobs. Crappy jobs can teach us something vital, if we’ll let them. One of my least favorites stints was at a call center getting cussed out on the hour, every hour for something I couldn’t fix or change. I wanted to quit/strangle a complaining-caller every.single.day. But I was getting married in six months and couldn’t afford a jaunt down Unemployment Lane. However, through all the call-center-crappiness I learned something vital — consistency. I learned to show up and do my work every.single.day. I learned to be patient, hold on, and just try to make it a couple times around the track. Even when I felt like throwing up. Crappy jobs and crappy leaders go together like peanut butter and jelly. And you know, we can learn as much from bad leaders as we do from the good. Begin writing down all the things your crappy boss does that you swear you won’t repeat. Someday you will be called to lead. Start formulating your vision now of how you will, and won’t, do it. I believe frustration is the most powerful and needed emotion to propel us to change. I’d rather we struggle through a crappy job that forces us to make a change, than a comfortable job that we sink into like a Laz-y-Boy. 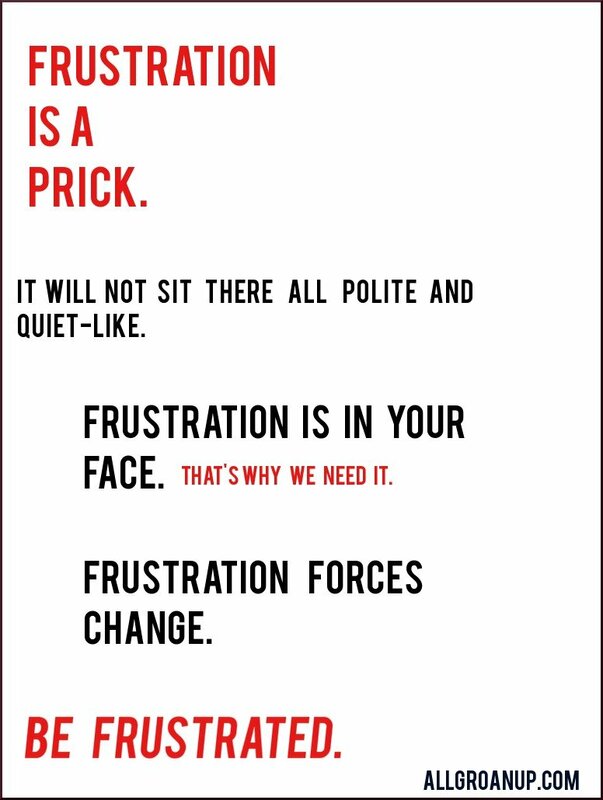 Yes, frustration is a prick. Frustration won’t sit there all quiet-like and polite. No, it will gnaw at our insides like an angry rat on a corncob. Until you freaking do something about it. That’s why we need it. Frustration forces change. Be frustrated. Frustration will electric-prod-our-backside towards pursuing our dreams, passion, and talents — damning the fear of embarrassment or obsessive-comparison-disorder, in the process. First, before our crappy-cup runneth over with thankfulness, let’s shoot straight for a sec. Crap-filled jobs have always been around. My grandpa worked at a paper mill (dim lit factory of hard manual labor) for thirty years, SEVEN DAYS A WEEK. Our jobs mixing Machiatto’s or encased in cubicles would’ve probably seemed a vocation-vacation for millions from generations past and present. Please hear me, I’m not standing on Henry My High-Horse, yelling at you to buck up and stop complaining. Just remember that it could be helluva-a-lot worse. A little perspective can be powerful in making that crappy job smell a little better. Think back to a crappy job. What did it teach you?